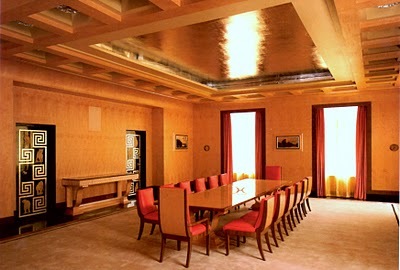 Eltham Palace is a large house in Eltham, South East London. It is currently owned by English Heritage and open to the public. 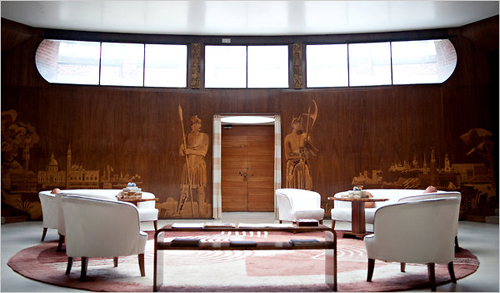 It has been said that the Art Deco house is a “masterpiece of modern design”. The original palace was given to Edward II in 1305 by the Bishop of Durham, Anthony Bek, and used as a royal residence from the 14th to the 16th century. Subsequently it fell into ruin. 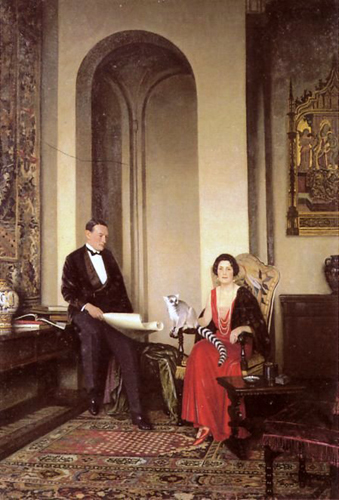 In 1933 Sir Stephen and Lady Courtauld acquired the lease of the palace site. They employed architects John Seely (1899–1963) and Paul Edward Paget (1901–1985) and fashionable Mayfair interior designer the Marchese Peter Malacrida (1889–1980) to design a new private house in the Art Deco style to adjoin the existing Palace building, which was extensively restored. The Great Hall boasts the third-largest hammerbeam roof in England. I was commissioned to carry out paint analysis on the interior. I was particularly keen to find out whether the dining room ceiling was originally given a layer of silver or aluminium leaf originally (it was the latter). Another of my projects on a Courtauld residence was at Home House. I have also worked at the nearby Eltham Lodge.